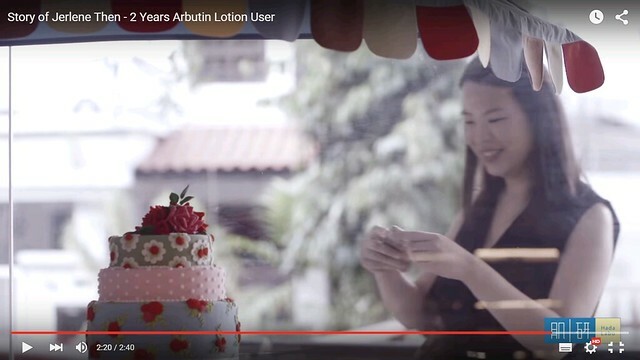 A few months back, I was approached to be part of the Hada Labo Bright Skin campaign for their Arbutin lotion. The campaign is finally out, and as part of the campaign there's a little page that shows my experience with the Hada Labo Arbution Lotion. For those who prefer Youtube, the video is also uploaded there too! I thought I'd just share a bit of some of the cool stuff I experienced being part of the campaign! 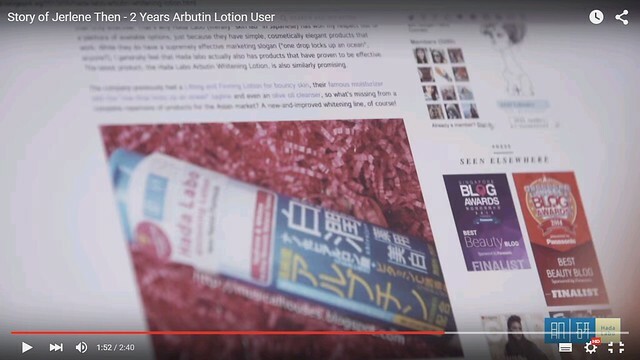 The campaign celebrates 5 years of Hada Labo Arbutin Lotion (which I've reviewed before), and in line with that, the brand was looking for 5 real users of the product who had used the lotion for 1, 2, 3, 4 and 5 years respectively, and also 5 different types of people (e.g. corporate types, active types, creative types, and so on). 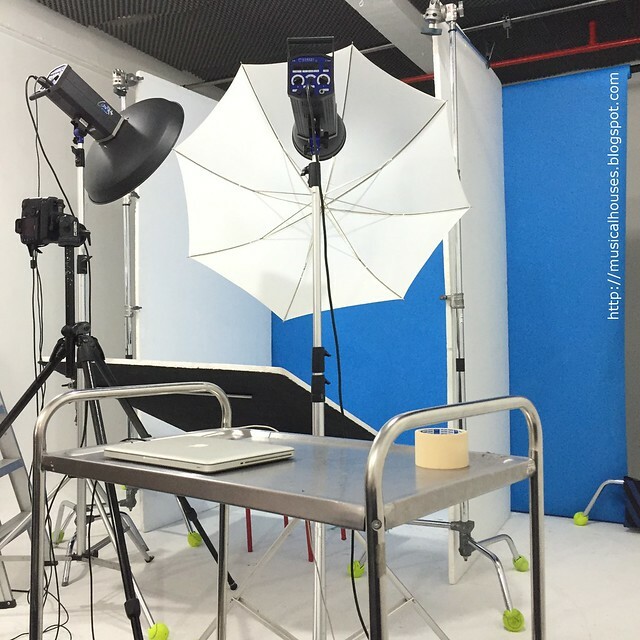 I was approached because the brand actually found me through my instagram profile because I uploaded some photos of their products, and had tagged the brand. Since this was a campaign featuring real users, I was not paid for my participation in the campaign, and my part in it was not scripted either. I was approached to be the 2-year user, and the corporate warrior/office worker type, which I am in real life. 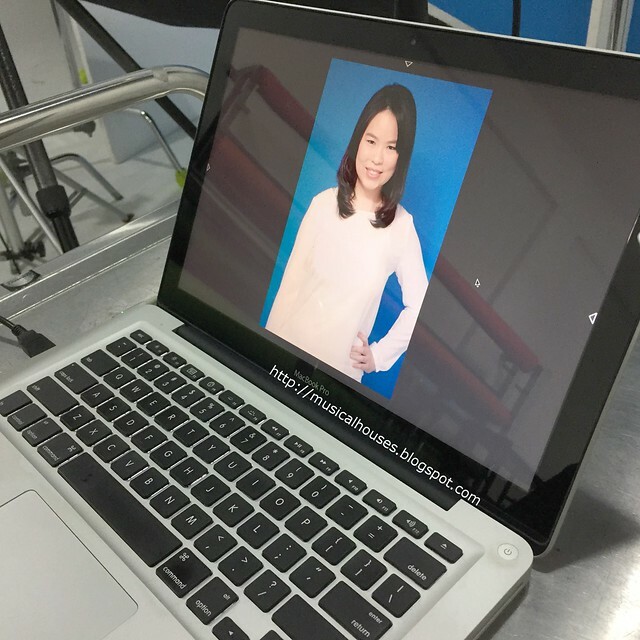 But because I was also uncomfortable with talking too much about my job in real life, we also discussed focusing on my personality as a fairly analytical person, with my blog as an example of that analytical ability extended to evaluating products and skincare. I do mention my field in brief in the video, but it's not the focus of the video. So I was very happy that I wasn't shoved a script in my face and told to recite it, and that they were able to take into consideration my concerns and desire for (some) privacy. After that, I was brought on to do the photoshoot and videoshoot for the campaign. And I took some behind-the-scenes photos, which I thought I'd share with you guys. They're all taken with my iPhone, and I didn't take that many, because I didn't want to interrupt the work that was going on, or get in anyone's way, so for the most part, I waited until there was some downtime, then quickly took a shot or two on my iPhone. But, I think I took enough photos to give you a sense of the entire process! The actual execution took two separate half day sessions. 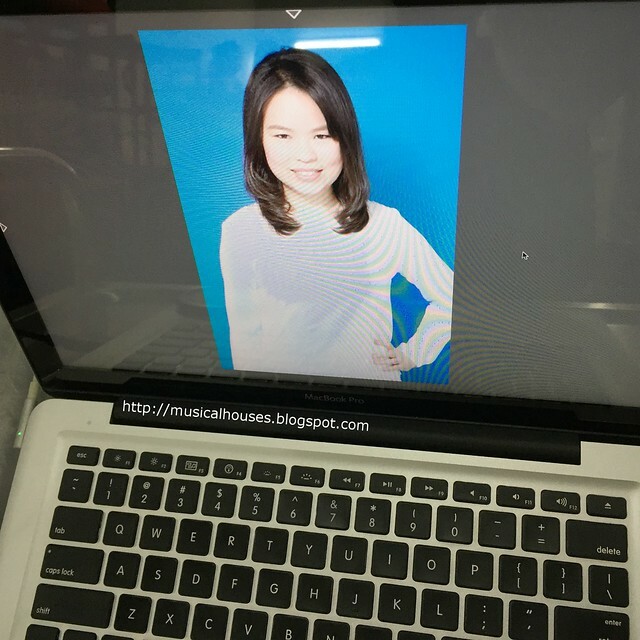 One half day was for the photoshoot, where we shot the still photos of me wearing the white top. The second session was for the videoshoot, where we shot the video scenes. For the voiceover/interview bits, those were also taken during the videoshoot. For the photoshoot, because I'm obviously not a professional model or anything, I was pretty clueless as to how to stand or act in front of the camera. Fortunately, the photographer gave me directions for posing: how to stand, and what angle to face, and where too look. I had a lot of trouble with my eyes, and in virtually every single shot they were closed or really small or squinting. This is partly because I do have small eyes, but also because they were using flash as part of the setup, and I was blinking involuntary everytime the flash went off. It was so hard to keep your eyes open when bright lights are going off! Above and below are photos of some of the photos taken from the shoot, right off the camera (so no photoshopping in these photos). Danny Kong (Dannymagichand on IG) was the hair and makeup artist, and he really did a great job. When I showed these photos to my family, they thought that there was some editing done to the photos, but it was just good old fashioned hair and makeup. 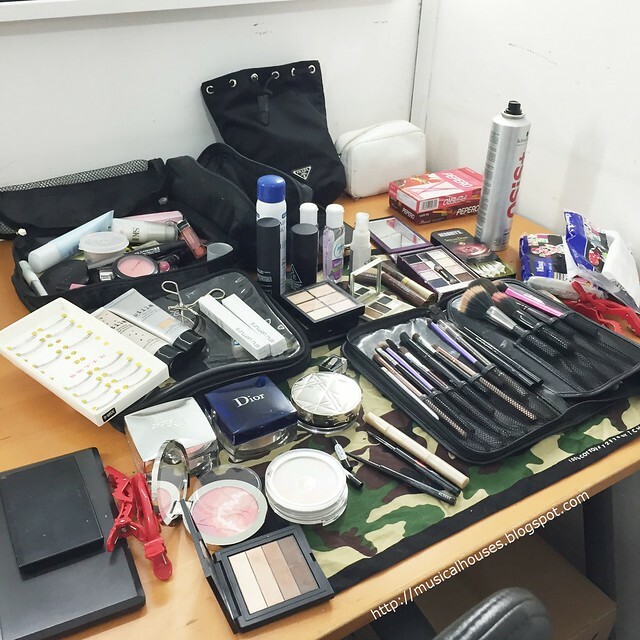 And below, Danny's workstation, with all those droolworthy products! I didn't take down the names of the products that were used on me (like I said, I didn't want to interrupt the professionals at their work), but I did notice the blush that was applied on me was MAC Dainty. I think I will have to go and get that blush now! For the video shoot, the half-day session was spent filming the various scenes shown in the video - there are scenes of me applying the lotion to my face, which was quite funny because there were like 3 or 4 people crammed into a bathroom (including myself) during the filming. There was also some issues with reflections and light bouncing from the walls, which were slightly reflective, and the camera also had to be set at an angle so that it would not be visible in the reflection in the mirror, and so on. It really opened my eyes as to how much work goes into filming a few seconds of footage. No wonder movies take so long to make! Above, that's the team reviewing the footage to make sure that it's acceptable before going on to the next shot. And below, a screenshot from the video itself (in case anyone wants to know exactly which part of the footage this corresponds to). You can see the bottle of Hada Labo Arbutin Lotion reflected in the mirror, but not the camera, although it's there, because it's behind me at an angle. Pretty cool, right? The next set of scenes was inside the cafe, working on my laptop and taking notes and things like that. 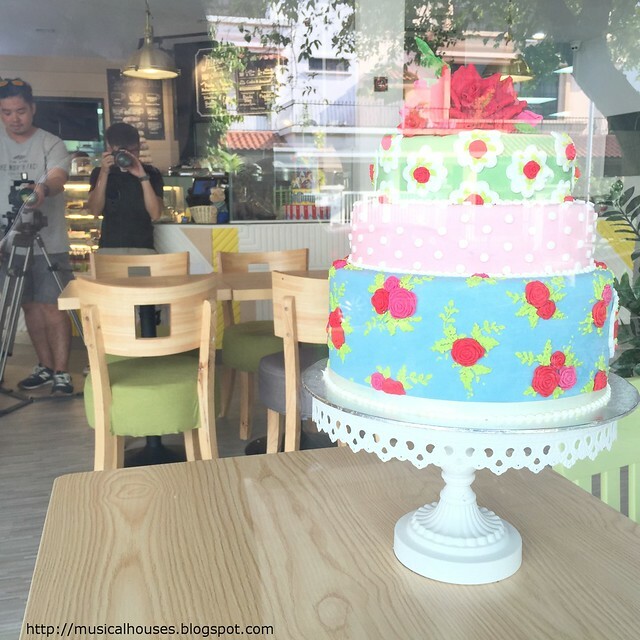 This was shot at Cake Avenue Cafe, which, as the name suggests, is a cafe. 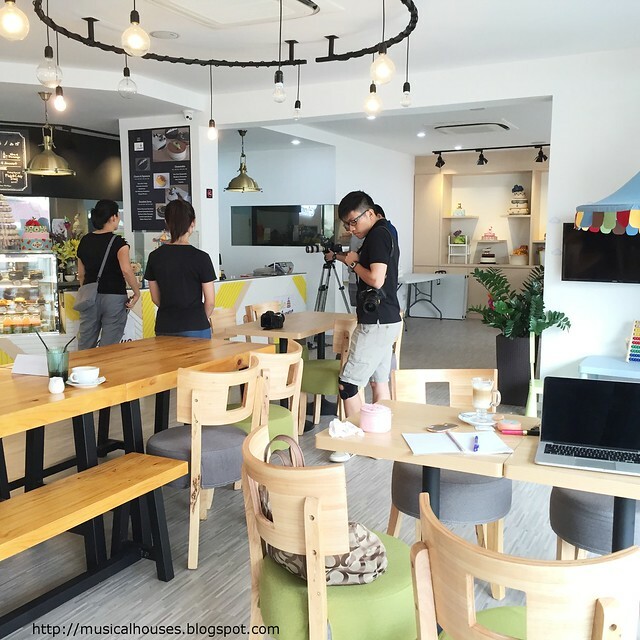 It has a pretty laid back atmosphere and vibe. Above, is my view from the shoot. You can see the laptop in front of the chair that I'm sitting at. The camera is actually set up further away, so it wasn't all in my face. Below is the corresponding part of the video that features this setting. There's also a scene where I take a photo of a cool-looking cake. Which, I might add, is totally in character, because my Instagram page, despite being a beauty page, is always invaded by food - I'm constantly snacking and sometimes, I'll be eating (or about to eat) something, when the idea for a flatlay strikes me. And sadly (or happily, depending on your point of view), it usually ends up being not-that-healthy food, like cookies, chocolates, cake, snack packs, sweets, and local fare like tangyuen and egg tarts. So although it wasn't deliberately planned or anything, it was quite apt. Above is the actual shot in the video that I'm referring to. Below, is what it looked like to me during shooting. The cake is pretty. (I don't think it's edible, though.) You can also see the cameras in the background, too. Lastly, there were the interview scenes. I didn't take any photos of this portion, as we were wrapping up the shoot. The format was that they would ask me questions, and I would be filmed answering those questions, and those answers were what they used for the video in the end. The answers to the questions were all unscripted - I didn't memorize any of the answers beforehand or anything like that. I did have a rough idea of what they wanted me to touch on before shooting. For example, I knew that they wanted to focus on the analytical side of my personality and talk about the ingredients in the products and so on, but the exact questions I was asked, and my corresponding responses, were all done on the day itself. So other than a few lines that were catchphrases they wanted to use in the campaign (e.g. the taglines "all that glitters is not gold", "naturally rational choice"), everything was unscripted and just me responding to the questions on the spot. Sometimes they would ask me to talk about a specific topic, e.g. tell me what kind of questions you get from your blog readers, tell me why you use the product, but nothing was scripted, and nothing I said was prepared beforehand. Obviously, the final video is a pastiche of the various scenes I filmed and things I said, but I think it was a fair representation of my own views and what I said as a whole. My final thoughts on taking part in the campaign are that I was generally very happy take part in it. In particular, I really appreciated that I was able to take part in a campaign in a non-sellout or non-shilling kind of way, and that I was able to speak honestly on my experiences with the product, rather than relying on a memorized script or anything like that. I also really appreciated being able to talk about the product in a way that was in line with my own personality and inclinations. I guess that the fact I wasn't paid for my part in this campaign meant that I was able to be more involved in terms of what I said. So I really appreciate that the campaign is, for me anyway, more authentic and different from the usual "pay a model to front the brand" type of spokespersons we often see. If you haven't seen it yet, I'll just end off with the video from the campaign (for those unfamiliar with it, yes that is indeed English I'm speaking, I just have a Singaporean accent!). Congrats on the campaign! Very cool! Haven't tried this yet but heard SO MANY great things! This is so cool to see the backstage view of the shoot. I thought you and they did a fabulous job. Wow, super impressed to hear that you guys aren't paid for these ads, I'd assumed it was a paid ad when I saw it. And you look so gorgeous! 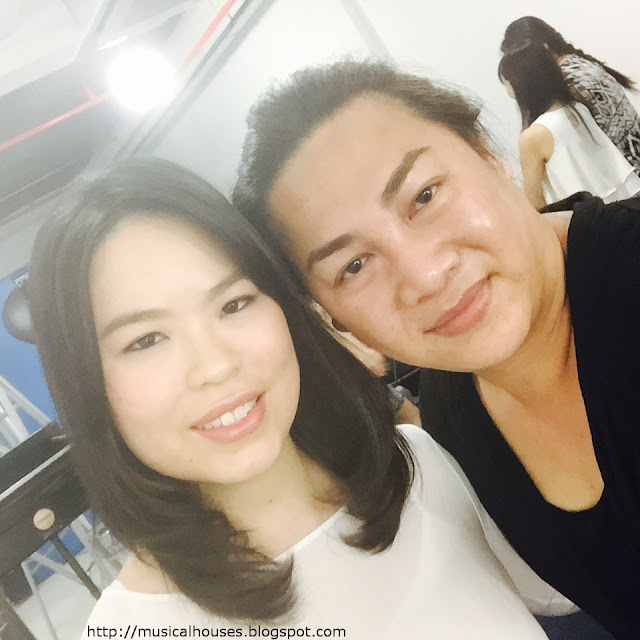 Love your hair and makeup! I think you look better without glasses! congrats! been using hada labo for over a year now and it's truly magical. your makeup and hair look awesome too. Congrats Jerlene! You look beautiful as always. I'm so happy for your success! Glad to see you on AB too :D.
Congratulations! You look great and did a fab job! Hada labo the essence toner is my holy grail. I used them like water. i like the toner essence just wet on my face, quince on the face for hydration. Although the amount i use quiet alot which is 1 palm x2. It is still last me 6 to 7 months for 1 full 170ml. Normal price is in Malaysia RM59.90. But sometimes there will be sale on weekend 30% so it will be RM 41.90. The cheapest i can search. So stock them up before they get price hike up. Bottle and bottle used up. The result is supple skin with glow. Another thing a like about Hada Labo product is that it is fragrant free, alcohol free and so on. Now Hada Labo also make the essence toner into 2 version: Light and Rich. Light (Yellow Japanese words below the bottle) is for oily to combi skin. Then the Rich (Red Japanese words below the bottles) is best for those with drier skin type. Now it suit all skin type. Im using Light version as my skin is oily combi skin. Til now, it does not break me out. It's amazing how you co-opt a great blog for this commercial crap. Why is it that countries that have women of color, have a HUGE business in making sure women who are lighter are rewarded for being light? In your culture it's clear that you've got dark skin by your facial features. Yet, instead of being proud of it, you shill for a company with questionable science and couch it in "analytical" when it is just and ADVERTISEMENT!!! @Anonymous: (Part 1 of response) Thanks for your frank, although anonymous, opinion. By any chance, are you Asian, or familiar with Asian beauty products? The reason why I ask is because I suspect from your comment that you are probably neither, and perhaps some lost-in-cultural-translation aspect of the campaign rubbed you the wrong way. If you were, you would have better understanding of the context for this campaign, and you might not be so upset about it. If you were familiar with Asian beauty products, then you would know that the term "whitening" usually denotes a product with properties like "brightening" "evening skin tone", or "luminizing", or that sort of thing. Such products are extremely common across Asian brands, including most Korean and Japanese brands, so virtually every major and minor brand has a line of such products, and they are almost always called "whitening" products (so if your unhappiness is towards "whitening" products, then pretty much every brand here will make you unhappy). Perhaps it is not the most ideal term, but in Asia, it is used so commonly among many brands because Asian consumers understand that the term "whitening" to be a description of the product's function (brightening, improves overall skintone), and it has become something of a naming convention for such products by now. As it is used today to describe beauty products, it does not have any racial or class connotations in the sense that you are trying to be "more Caucasian" or "more upper class", although sometimes Westerners get such an impression because to them the word "white" comes with an undertone of race. I'm an Asian girl who was born, bred, and currently living in Asia, and if this campaign was offensive to me or to other Asian consumers, I definitely wouldn't have taken part in it! If your concern is that the campaign is offensive towards Asians, then please rest assured that this campaign isn't offensive to Asian girls living in Asia at all. 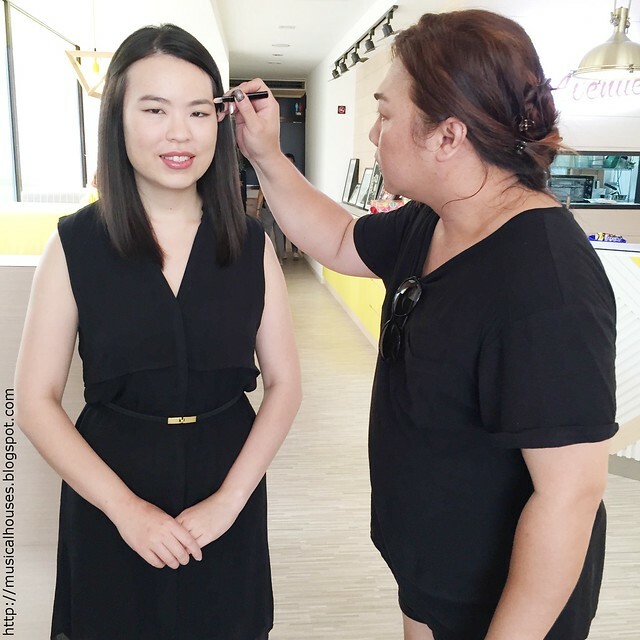 In fact, all of the feedback I've gotten from my Asian readers and friends has been positive so far - the most common feedback I've gotten is that they are happy that I can help them understand why the product works and what ingredients make it work, and they are more convinced that the product works because of my explanation. @Anonymous: (Part 2 of response) Also, the reason why I thought from your comment that you weren't Asian, is because of your remark that "it's clear that you've got dark skin by your facial features". It is a rather odd remark that I'm pretty sure noone who lives in Asia or is Asian would make. If you've read my blog before, I've mentioned on my blog that I am Chinese, and my skintone is NC20 in MAC's colour code. You can also see this from my other FOTDs on the blog, and photos of me on both Instagram and FB (both uploaded by myself and tagged by others). I'm not sure how much you know about Asian skintones or specifically Chinese skintones, but even within the Chinese race, there is a huge variety of skintones - some Chinese people are naturally very fair, and some are naturally very tanned, and there is every shade in between! My features are obviously Chinese features, but because Chinese people can have a wide variety of skintones and features, there really isn't any correlation between skintone and facial features. So, to presume something like that and make a comment that "your facial features make it clear that you're dark" would be pretty presumptuous, and could be offensive to some people. It's the equivalent of saying "From your facial features you've got dark eyes and a large mouth and dark hair, therefore you must be dark skinned" to a Caucasian person. Chances are, their response would range from perplexed to insulted, because they wouldn't see a correlation between their facial features and how fair their skintone is, because there is considerable variety in facial features/hair colour/skintone among Caucasians too. So this is why I found your remark about my facial features and dark skin quite odd. Lastly, while this is an advertisement on the company's side, I'm not actually paid for taking part in the campaign. I took on the campaign because I have tried and liked the product before. In 2013 (2 years before the campaign even started), I actually reviewed this very same product and gave it a good review (the review is linked to a couple of times in the post). So I'm not "shilling": I'm definitely not paid to say nice things about a product I don't believe in. In actual fact, I tried the product first and liked it, and 2 years later, when the company was thinking of bringing on real users of the product for a campaign, they noticed me and reached out to me. Also, I've been doing science-based ingredient analyses and analytical posts on my blog for a few years now, and if you've been reading my blog over time, you'll know that it's definitely part of who I am and how I blog, and not a "shilling" thing for the campaign. So the "analytical" part is definitely me! Anyway, that was a long response (spanning multiple comments! 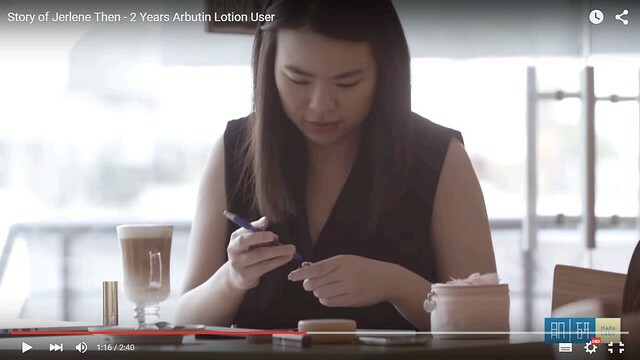 ), but I hope it helps to give you a bit more context about Asian beauty products and some of the naming conventions of such beauty products, Asian skintones and features, as well as my own participation in the campaign. I know sometimes things can get lost in translation when being seen by someone from a different background, so I thought it would be useful for me to take some time to explain the context a bit more. Hope this helps! No need to call people whores, haha. Wow. Jerlene, I love this campaign! It's so great to finally see you "in person". You're just as articulate and eloquent here as you are in your blog. As a fresh graduate of my school's business program, it's great to see another beauty enthusiast working in the same field. Keep doing what you're doing. You're so famous! I know a famous person! :D Well, internet "know" anyway. Congratulations! Hi Jerlene! Congrats on the campaign! :) What I love the most about your blog is that you'll go the extra mile to analyze the ingredients! Just wondering, do you know any products that are effective for removing stretch marks and scars?